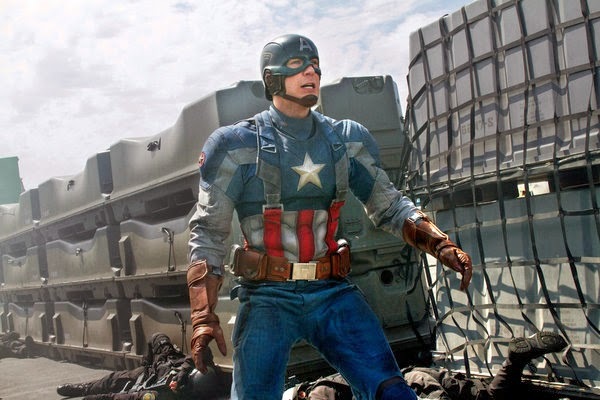 It’s a bird, it’s a plane — oh, wait, it’s Captain America. The costume looks different, of course, as does the looker (Chris Evans) squeezed into the form-fitting corporate brand. But, gee, it can be hard keeping track of all the men flying and fighting in the superhero cinematic universe. Next up is yet another Spider-Man movie, and then come the X-Men, and then the Guardians of the Galaxy, and then (again) the Avengers, whose numbers include Captain America. So, he’ll be back. Meanwhile, he has another movie to call his own, “Captain America: The Winter Soldier,” one that, like many others of its type, gets off to a kinetic start only to lose steam before blowing everything up. As with every new chapter in such series, introductions must be made in “The Winter Soldier” so that nonenthusiasts can meet the team members and grasp their place in this cosmos. Here, these include Bucky Barnes (a good Sebastian Stan), Natasha Romanoff a.k.a. Black Widow (Scarlett Johansson) and Nick Fury (Samuel L. Jackson), who run S.H.I.E.L.D., the spy agency that here gives the movie its topical gloss. Kevin Feige, who runs Marvel Studios, has said that the Russos were hired as directors “because they loved our explanation that we really want to make a ’70s political thriller masquerading as a big superhero movie.” That’s the idea anyway, which explains why Robert Redford, the star of ’70 paranoid classics like “Three Days of the Condor,” plays Alexander Pierce, a S.H.I.E.L.D. official. The Russos have directed a few other movies, including “Welcome to Collinwood” (2002), a redo of the 1958 Italian satire “Big Deal on Madonna Street” that was produced by Steven Soderbergh and George Clooney. That movie didn’t go anywhere, but, having been put on the industry map with that kind of patronage, it’s no surprise that the brothers went on to have a busy decade in television, working as directors and sometimes executive producers for the smart sitcom likes of “Arrested Development” and “Community.” In between, they also directed another movie, “You, Me and Dupree.” It was a dud, but it didn’t matter. In the magical world of big-screen entertainment, some guys get all the breaks and also the keys to the studio gate, meaning a franchise like this. 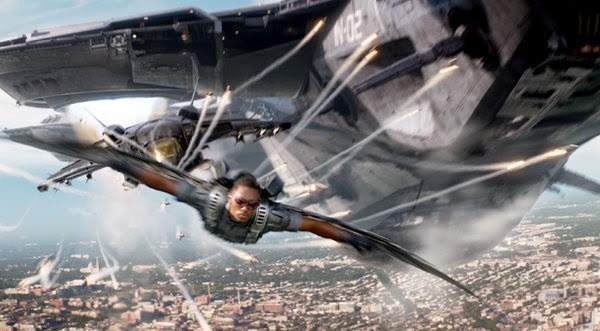 Given how little creative wiggle room there is in properties like “The Winter Soldier,” it’s a minor triumph that the Russos imprint any personality on the movie, which is less a stand-alone work than a part of an ever-expanding multimedia enterprise. The directors make their presence felt largely in the first half when they’re emphasizing Steve’s humanity, whether he’s in costume or not. That’s partly the point of his introductory race around the reflecting pool: He runs like the wind, but he also makes you laugh. This emphasis on the human also spills over into some exciting, smartly staged and shot action sequences, including choreographed fights in which the entire bodies of the performers remain visible in the frame and aren’t dissected by the camera and editing. “The Winter Soldier” becomes progressively less enjoyable once the plot thickens and a menace looms, as Fury moves one chess piece, while Pierce moves another. Captain America doesn’t move much, beyond cars and debris. However appealing, Mr. Evans remains a recessive screen presence, and while it may be a relief that Captain America isn’t angst-ridden, he’s blandly well adjusted for a guy who, in his last movie, emerged from a decades-long deep freeze. Comic-book movie directors have to sell the prepackaged goods while trying to capture — and maybe redefine, as Christopher Nolan did with Batman — a superhero’s essence. And they have to do so without boring everyone who could not care less why a crusader went dark as night or that he died only to be reborn. But what if he’s kind of dull? Heresy! Yet one of the problems with Captain America, who was introduced in 1941, is that he didn’t cross over into the mainstream until three years ago with “Captain America: The First Avenger.” Directed by Joe Johnston, who wisely kept the irony in check, “The First Avenger” hit the origin-story marks by tracing the metamorphosis of a 90-pound weakling into a World War II hero while showing that Mr. Evans could wear the suit and throw a punch. It was amusing, old-fashioned and ponderous, just like its protagonist. The sequel, which was also written by Christopher Markus and Stephen McFeely, suffers from some routine blockbuster sins, including an excess of plot. But it, too, doesn’t make the case on screen for why Captain America should have been taken out of mothballs. Despite Mr. Evans’s stated lack of passion for playing super-characters like this one and despite the genre’s creeping exhaustion, Captain America seems likely to keep running and jumping. Unlike the James Bond movies, which have dribbled out fairly slowly or a series like Harry Potter, which has a finite number of exploitable titles, there appears to be no end in sight when it comes to superhero movies. Warner Bros. has introduced Batman twice in separate franchise cycles and Sony has done the same, at a faster clip, with Spider-Man. In other words, superhero stories have become, or at least some would claim, the Hollywood equivalent of, say, Shakespeare: a well that they return to again and again to reboot, remake, redesign and resell until death (ours, the art’s, the planet’s) do us part. “Captain America: The Winter Soldier” is rated PG-13 (Parents strongly cautioned). Comic-book movie mayhem. WITH: Chris Evans (Steve Rogers/Captain America), Scarlett Johansson (Natasha Romanoff/Black Widow), Sebastian Stan (Bucky Barnes/Winter Soldier), Anthony Mackie (Sam Wilson/Falcon), Cobie Smulders (Agent Maria Hill), Frank Grillo (Brock Rumlow), Hayley Atwell (Peggy Carter), Toby Jones (Dr. Arnim Zola), Georges St-Pierre (Batroc), Robert Redford (Alexander Pierce) and Samuel L. Jackson (Nick Fury).